Reminder we have a very active Facebook page where we promote our artists, announce calls for art/artists, share art related events, workshops, and upcoming events. Keep up with art related news from all across Missouri and beyond. 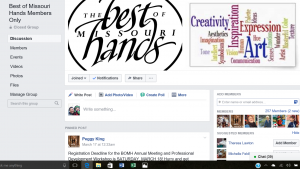 Please LIKE and FOLLOW our BOMH FB Page and if you are a current Member of the BOMH, please join our Members Only FB Page, where you can share your work, ask questions, share your knowledge, and network with fellow members.